Preprints (earlier versions) of this paper are available at http://preprints.jmir.org/preprint/10252, first published Mar 05, 2018. Background: Gaming techniques are increasingly recognized as effective methods for changing behavior and increasing user engagement with mobile phone apps. The rapid uptake of mobile phone games provides an unprecedented opportunity to reach large numbers of people and to influence a wide range of health-related behaviors. However, digital interventions are still nascent in the field of health care, and optimum gamified methods of achieving health behavior change are still being investigated. There is currently a lack of worked methodologies that app developers and health care professionals can follow to facilitate theoretically informed design of gamified health apps. Objective: This study aimed to present a series of steps undertaken during the development of Cigbreak, a gamified smoking cessation health app. Methods: A systematic and iterative approach was adopted by (1) forming an expert multidisciplinary design team, (2) defining the problem and establishing user preferences, (3) incorporating the evidence base, (4) integrating gamification, (5) adding behavior change techniques, (6) forming a logic model, and (7) user testing. A total of 10 focus groups were conducted with 73 smokers. Results: Users found the app an engaging and motivating way to gain smoking cessation advice and a helpful distraction from smoking; 84% (62/73) of smokers said they would play again and recommend it to a friend. Conclusions: A dedicated gamified app to promote smoking cessation has the potential to modify smoking behavior and to deliver effective smoking cessation advice. Iterative, collaborative development using evidence-based behavior change techniques and gamification may help to make the game engaging and potentially effective. Gamified health apps developed in this way may have the potential to provide effective and low-cost health interventions in a wide range of clinical settings. Mobile phone use is increasing rapidly in both developed and developing countries, and by 2020, 70% of the world’s population will be using mobile phones [1,2]. Three billion people globally currently use mobile health apps [3-5], with over 165,000 health apps available worldwide . Health apps are in high demand. A recent study reported 800,000 downloads per month of smoking cessation apps worldwide ; there were 400 smoking cessation apps available on app stores in 2013 when Cigbreak development began . However, most health apps are not developed from a theoretical basis that draws on evidence-based behavior change techniques (BCTs), and there is little evidence that public health practitioners or users have participated in design [6-10]. To date, there have been few rigorous evaluations of the effectiveness of health apps [2,11-14] although pilot studies and small trials have shown promising results [9,11,13,15,16]. Maintaining users’ engagement with health apps is not easy, with 77% of apps going unused only 72 hours after being installed [10,17,18]. One potential solution to this problem is gamification, which aims to harness the motivational power of gaming elements such as badges, leaderboards, competitions, rewards, and avatars to increase user engagement and hence improve effectiveness [2,19]. Gamification shares key elements with established health BCTs and behavior change theory [20,21], and there is growing evidence that gamification increases engagement with health apps [10,18,22,23]. Despite this, a recent review found that only 4% of top-rated health apps on the Apple and Android stores made use of gamification principles . In recent years, standards have been established for health app development , and there are some examples of well-developed health apps that are evidence- and theory-based with expert design [9,13,15,25,26]. The British Standards Institution has formulated a code of practice for health and wellness apps, providing app developers with quality criteria to consider during the development process . However, there is a lack of worked methodologies that app developers and health care professionals can follow to aid development and incorporation of appropriate features. In 2013, a group of clinicians, researchers, and game developers set out to build a dedicated smoking cessation app Cigbreak, developed in collaboration with potential end users. Gamification and theoretically validated BCTs were included, including those shown to be beneficial in smoking cessation [27,28], with the goal of creating an engaging, scientifically grounded health app. The current version of Cigbreak involves players swiping their screen to break cigarettes as they dance upward from a generic cigarette pack, providing a distraction from cravings. Smokers progress along a path through a garden to a smoke-free finish line (Figure 1). Along the way, players can complete diary entries and overcome specific daily missions. Players are rewarded for both real-life smoking cessation behavior and progress through the game with health messages, coins, and trophies and are given personalized feedback. Player’s progress can be monitored and shared on Facebook, providing social support. Nicotine replacement therapy (NRT) power-ups inform players of the different kinds of NRT available, encouraging pharmacological support. This paper documents the development process in a series of steps, providing a worked example for future development of gamified health apps. Figure 1. Screenshots of Cigbreak. Principles of agile development were adopted  where prototypes were developed rapidly and systematically modified according to user feedback. The methods adopted in Steps 1 to 7 are described below. We aimed first to gain an understanding of the research problem (why do people still smoke?) and to identify key user preferences for app functions. Doctors, health psychologists, and researchers worked closely with app developers to incorporate established smoking cessation methods and validated BCTs. Feedback from users was obtained following each iteration to refine app functions or features. At all stages of development, the focus groups involved participants using actual prototypes of the app, having hands-on experience on mobile handsets that we provided in the 10 focus groups. Focus groups were held throughout the development process (step 2 and step 7). Participants were recruited through pharmacies in Tower Hamlets, London; Eurogamer (Europe’s largest gaming show); a community development charity in East London, Social Action for Health; Kick-it the smoking cessation scheme facilitated through the Tri-borough Council, London. Moreover, 10 focus groups were conducted in total with 73 participants (male [n=34] and female [n=39]). In total, 2 focus groups were conducted at Chapel Hill, University of North Carolina, to understand the differences in smoking/ cessation culture between the United Kingdom and the United States, which might affect design requirements when making the app available globally. Furthermore, of the 10 focus groups, 3 (n=26) were conducted during early development as documented in step 2. There was a wide range of ages (15 to 67 years) and ethnicities (Bengali, Turkish, Russian, Polish, British, American, or African-American) represented in the focus groups, which included smokers who may find it difficult to access standard smoking cessation services (NRT and behavioral support [individual and group]), for example, routine and manual workers and adolescents. All focus groups were conducted over a 90-min period and led by a trained facilitator (EAE) and assisted by 1 other team member (HC, LS, CR). Participants were asked to use the app for a 30-min period. The remaining 60 min were used for discussion. A basic structure was followed; however, content was also guided by participants. Questions in the first 3 focus groups differed and focused more on participants’ smoking behaviors and ideas for smoking cessation app content. The later focus groups focused more on providing user feedback on the various iterations. Participants were also asked to complete a questionnaire at the end of each focus group. Tobacco dependence was measured using the Fagerström test for nicotine dependence [30,31], and participants were asked about any current treatment they were using to help them stop smoking. Questions were also asked regarding the appearance of the app, enjoyability, and usability, and participants were asked if they would recommend the app to a friend. Participants were given £20 to show appreciation for their time. Voice recordings of the focus groups were taken and transcribed, and observational notes were made. Thematic analysis of the data used a framework approach [32,33]. A trained researcher (EAE) independently analyzed the focus group transcripts; however, any uncertainties were discussed with the study team. We did not double code because we were coding for concrete themes to aid app development rather than conceptual themes; the second researcher in each focus group was able to check themes against their own perceptions. Moreover, 5 interconnected stages were followed in the analysis: (1) familiarization with the data, (2) identifying thematic frameworks for themes arising, (3) indexing—highlighting relevant quotes, (4) charting—arranging the quotes under themes, and (5) mapping and interpretation [32-34]. Furthermore, focus groups were conducted until a saturation period was reached in which no other new themes emerged. No software was used to conduct coding or identify themes. A multidisciplinary design team with appropriate experience and expertise was formed to aid in the design and construction of the app. The team included a senior app developer (HC), computer scientists (YP and DG), clinical doctors (EAE and RTW), a senior health psychologist (LS), a senior medical sociologist (CR), and several smoking cessation advisors from the London Kick-it smoking cessation scheme. The membership of the design team was consistent over the development period. Extensive input from the public and potential app users was sought throughout development. The team brainstormed extensively before any coding began, to establish key concepts and constructs to be included in the app. The design team met once per week throughout the development period. Meetings were chaired by a facilitator (RTW), and decisions were documented and logged. First, we set out to define the problem, exploring factors influencing nicotine addiction and successful quit attempts, and we then explored user preferences with our main goal to establish app components required to create user engagement, resulting in a smoking cessation app likely to be retained by users. In total, 3 focus groups with 26 smokers were conducted. Cigbreak development was guided by the Medical Research Council framework for complex interventions  following the British Standard Institute Code of Practice for Health and Wellness app development . The latest guidelines for effective smoking cessation were also considered [36-39]. Cigbreak was designed with 30 game levels, which were estimated to take an average user 28 days to complete. Evidence suggests that being abstinent for 28 days increases the chance of successfully quitting , and hence Cigbreak can support its users through the most critical period of their smoking cessation attempt. There are several taxonomies or frameworks of gamification available [21,40-43]; however, there is a recognized lack of high-quality studies  and only 1 taxonomy has been validated [40,44]. Given the lack of empirical guidance in this area, we relied on the experience of our expert multidisciplinary design team aiming to create an engaging and entertaining game. Having gamified the app, we then turned to one of the more popular taxonomies to deconstruct Cigbreak in an effort to understand how the game might address various aspects of motivation and to optimize features. Cugleman and colleagues identified 7 key gamification strategies: goal setting, capacity to overcome challenges, providing feedback on performance, reinforcement, comparing progress, social connectivity, and fun and playfulness . A BCT is “an observable, replicable and irreducible component of an intervention designed to alter or redirect causal processes that regulate behavior; that is, a technique is proposed to be an ‘active ingredient’ (eg, feedback, self-monitoring, reinforcement)” . BCTs have been clearly defined and classified into an internationally recognized taxonomy . It was understood that if our intervention was to be effective, it would be important to make good use of BCTs. Therefore, in addition to providing distraction from cravings, the game would become part of a causal pathway for health behavior change. This development phase of Cigbreak involved close collaboration with a health psychologist, who advised on BCTs on the basis of strong empirical evidence for their efficacy [27,28] and feedback gained in earlier focus groups. A systematic review of BCTs in existing health apps was also conducted . Self-regulatory BCTs (feedback & monitoring including self-monitoring of behavior) have been commonly used in gamified apps to promote physical activity, healthy eating, and alcohol reduction [2,12,46,47]. These specific BCTs were effective in achieving behavior change in previous studies [48-53], and therefore, they were an obvious choice for inclusion. A logic model to describe the program theory behind the intervention was formulated, and methods of representing and examining the operation of the intervention in mathematical models were researched. Cigbreak was built in Unity for Android  by Healthy Games Ltd. The use of a preexisting game engine facilitated rapid development of app prototypes, which could be circulated among the team and focus groups of smokers. Personal experiences, concerns about ill health, financial pressures, and family/friends were key motivational themes for stopping smoking. Environmental factors and mood played an important role in whether smokers continued to smoke. Smokers identified a need for extra support and distraction from the action of smoking in certain environments. As their thoughts at these times were overwhelmingly related to smoking, a game including cigarettes that involved swiping them was felt to be helpful. It was this key finding together with brainstorming in the team that led us to develop the initial concept that the app could be used as a distraction from cravings. These focus groups drove inclusion of many other features such as giving information on health and finances and using family members to provide motivational cues. The key themes identified in motivational factors are shown in Table 1. Smokers perceived that health information including benefits of quitting and harms of smoking was important. However, smokers preferred more focus on positive outcomes and emotions rather than negative. Smokers felt that personalization was an important feature, including ability to set personal quit dates, plans, record relapses, and receive tailored text messages. The idea of a personalized diary to incorporate these aspects was popular among the smokers as were links to local pharmacies/quit services. The appearance of the app was identified as an important factor, with smokers wanting a bright, colorful app that was interactive and entertaining. Several smokers felt that gaming elements would aid in this goal. At the conclusion of this phase, there was a good understanding of user preferences, and the appearance of the app was beginning to take shape. The challenge was then to deliver an app that met user requirements in addition to using evidence-based smoking cessation advice and BCTs. The key themes identified for important features for a smoking cessation app are shown in Table 2. Game elements were incorporated by game developers and computer scientists (Table 3) . At the end of this phase, our design for Cigbreak included 36 BCTs (see Figure 2 and Table 4 for a full list). Two researchers trained in BCT coding (EAE and JL) coded Cigbreak independently in accordance to the (V1) BCT taxonomy . Screenshots of the Cigbreak app are shown with examples of BCTs highlighted. Note some screenshots may show multiple BCTs, which have not been highlighted but would have been coded accordingly. If I’m short of money one month, that definitely stops me smoking. When my mum was unwell with her chest, it definitely made me think of stopping. I would smoke if others smoked around me. Interestingly when you know smoking not a possibility don’t really get cravings e.g. on 10 hour flight. Table 1. Key themes identified in motivational factors affecting smoking and quitting. I think what you need to hear is that stern image you have on the back of cigarettes of what it is doing to you. Maybe it could give you an explanation of how your health is improving. I am craving so idea of a craving button which could be pressed when needed and links to a page with different management strategies e.g. play game, prompt to go for walk, speak to friend. Being personalized is definitely important. Maybe you could put dates in for your stop date. If you had a relapses you could put it in there too, so it is tied to your real time quitting. You could have it so when you wake up it says good morning this is your 11th day, that would be motivating, that would make me stop smoking. Maybe you could set it so it gave you little motivations reminders at times that you need them. It has to be interactive to work. Having a game and having to do something with your hands does work because you will spend an hour on that game before you have realized it and that an hour you have not smoked a cigarette. Games are very good, candy crush is brilliant, I was playing it at 3am when I wanted a cigarette, doing something quick with your hands takes your mind off it. Like for example I want to do something in my diary, like today I have stopped and I really fell like a cigarette, so I would write down I have saved x amount by not going out and buying cigarettes. After a week if would be good to tot up how much money you have saved. That would really help, or it could give locations of stop smoking places. I would like to know more about the different products available. It needs to have an emotional content, but I think more focus on the positive rather than the negative. I want it to help me relax. Table 2. Key themes identified for important features for a smoking cessation app. Table 3. Gamification strategies in Cigbreak, including their location in the app. Figure 2. Example of embedded behavior change techniques in Cigbreak. Table 4. Behavior change techniques (BCTs) in Cigbreak with location in the game. 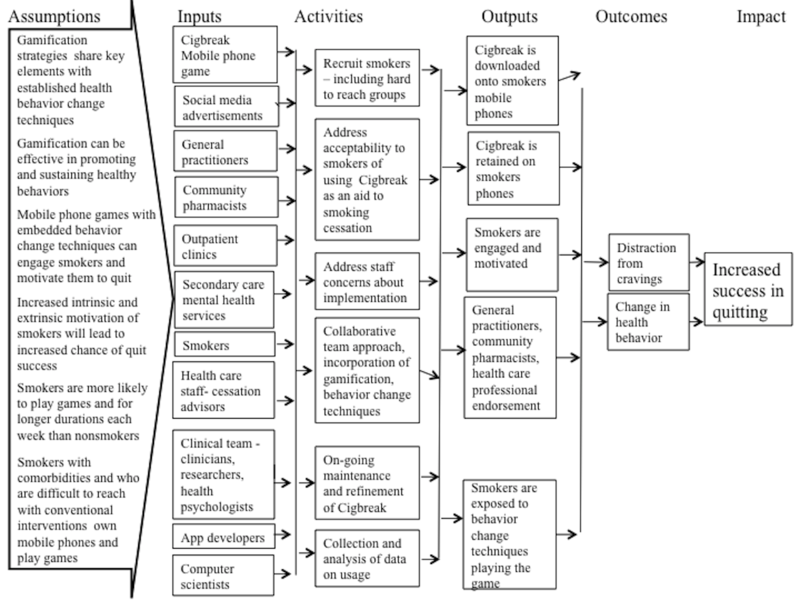 The logic model (Figure 3) describes basic assumptions on which the intervention is based, together with channels through which smokers are invited to use the app, for example, social media advertisements and recommendations by clinicians. The recruitment methods are designed to reach people who find conventional health care services difficult to access. The app is designed to record user engagement with BCTs and subsequent changes in smoking behavior to allow detailed temporal analysis of causal pathway assumptions. Frameworks and graphical models for exploring causal relations are well established [55-57], and causal methodologies to account for confounding by covariates are now sufficiently developed to enable effects of new public health interventions to be evaluated from observational studies [58-67]. The relatively unexplored approach of the Cigbreak app for improving public health holds exciting possibilities to form a defining example for the development of testing of causal assumptions and pathway analysis suited to app design. This would provide the framework for a more refined analysis of complex interventions with a dynamic longitudinal treatment regime resulting in long-term health benefit. Key themes were identified in a framework analysis (Table 5), and the app was redesigned accordingly. For example, players wanted the app to be more personalized. In response, a personalized diary for players was introduced, which allowed players to set personal goals and quit dates and to add pictures of the item or person motivating them to quit. At this stage of app development, the thematic analysis was oriented toward more concrete app features and design elements rather than abstract concepts. Players found the prototype app to be an engaging and motivating way to deliver smoking cessation advice, providing a useful distraction from smoking (Table 6), and 84% (62/73) said they would play again or recommend to a friend. Those with higher tobacco dependence as defined by the Fagerström test for nicotine dependence [30,31] and difficult-to-reach smokers appeared to be more engaged. Engagement was measured as both flow (focused attention and enjoyment) and usage (frequency, duration, and depth of usage) . Players said they would be happy to obtain this app from their pharmacy or general practitioner. The game was completed in 2015 with funding from the London Tri-borough Smokefree Alliance and is commissioned in 5 London boroughs. 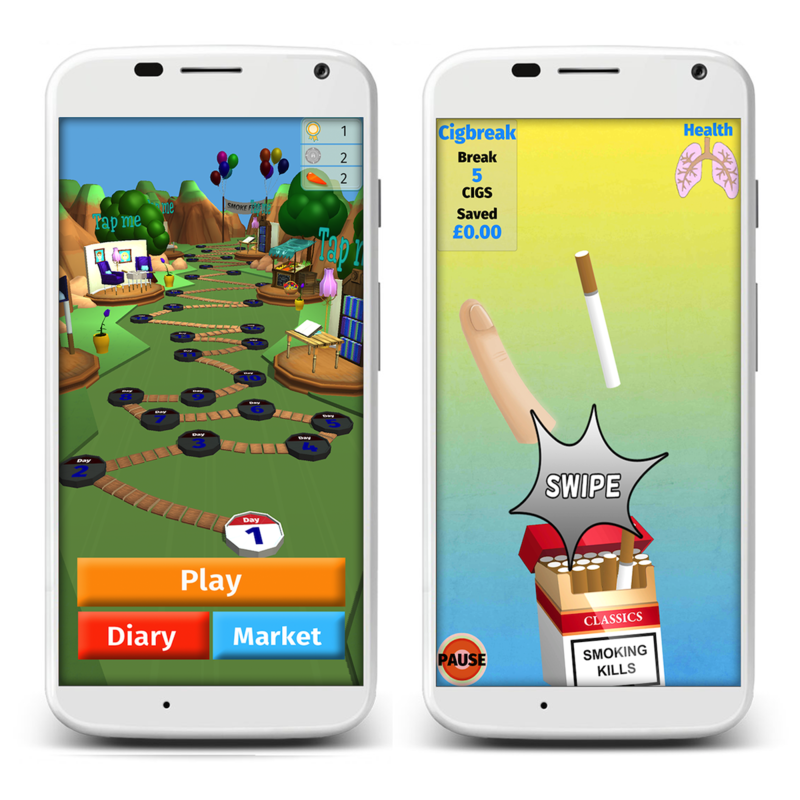 Following the final focus groups, Cigbreak was released on both Apple and Google Play stores in January 2016. Figure 3. Cigbreak logic model describing the intended operation of the intervention. I want to know the other benefits. I like the lungs in the corner but they need to be linked to reality. I need fear to motivate me. I want the game to be personalised to me. I like the character in the corner, but I want to personalise him. I want to go on holiday so my goal is to save £x. Needs more variation to keep you interested. It needs to get harder and harder and needs to be more engaging. Needs to be more interactive and enticing. Needs to be brighter in color. It would be good to see what I have saved per week. Table 5. Key themes identified by Cigbreak users to aid app development. I think it could work, candy crush saga was my life when I was quitting, so if it was related to smoking that would be even better. It definitely stops me thinking of cigarettes. I would pick this up and play when I had a craving. I could use this at the bus stop when I get cravings. Every GP should know about it, to give it to their patients. Table 6. Key themes identified using Cigbreak as a smoking cessation tool. A qualitative approach working directly with the target population at an early stage was key to the design process. Feedback on early prototypes helped us to gain an understanding of the problem , establish user preferences, and ensure desired functions were included [24,68]. Forming an expert development team was vital to ensure that our app was evidence based and potentially effective . Computer scientists and app developers were included to implement game elements and health psychologists, clinicians, and researchers for incorporation of BCTs. Careful consideration of which BCTs to include was needed, with a clear understanding of which techniques are theoretically linked to the required mechanisms of action . It was found that including imagery of cigarettes and smoking-related cues did not act as a trigger to smoke. Feedback from the qualitative work suggested that a smoking-related game would be more engaging compared with a nonsmoking–related game as attentional bias is toward smoking when craving occurs. The literature also supports this finding. A randomized controlled trial compared Nicot, a video game in which players crush virtual cigarettes in a 3D game environment, with a balloon popping game. Nicot was found to improve smoking cessation rates by 13% . Sanders-Jackson and colleagues found along with Due and colleagues, Hogarth and colleagues, and Meinke and colleagues that individuals who have chemical addictions are more likely to attend visually to objects associated with their addiction [71-74]. It was found that participants wanted to have positive rather than negative messaging and imagery. Gain-framed messages shift smoking-related beliefs, attitudes, and behaviors toward the direction of avoidance and cessation [75,76]. However, Mayes and colleagues found that a combination of both might be beneficial, specifically in younger smokers . Moorman and Putte found that a positive frame is preferable when nicotine dependence or quitting intention is lower, and conversely, a negative frame worked better when nicotine dependence and quitting intention are both high . There are currently no published frameworks for production of gamified health apps with systematic inclusion of BCTs or use of behavior change theory. Several nongamified health apps use an iterative user-centered design process [9,13,79-136]. Most apps are designed by an expert multidisciplinary team. However, only 3 explicitly used agile development [137-140], although this form of technology development is gaining in popularity, and it is anticipated that there will be greater use in the future. There are several published frameworks for developing nongamified health apps [26,139,141-147]. The Schnall and colleagues framework uses the Information Systems Research framework [141,148]. The Goyl and colleagues framework  combines knowledge to action  and the MRC framework for complex interventions . The Tombor and colleagues framework  is also guided by MRC framework for complex interventions and Multiphase Optimization Strategy [35,150]. Moreover, 6 frameworks also consider the incorporation of behavior change theory. Curtis and colleagues adopted the behavior change wheel (BCW) [144,151]. Tombor and colleagues also uses the BCW and the BCT taxonomy version 1 [26,45,151]. Wilhide and colleagues consider behavioral models , whereas Goyal and colleagues and Whittaker and colleagues incorporate social cognitive theory [143,146,152]. Mummah and colleagues combine use of both theory and a taxonomy . Of the frameworks, 3 do not incorporate any form of behavior change theory [139,141,147]. As this area of research is still nascent, it is unclear if any of the above approaches are superior to the approach adopted. The framework recommend is based on our experience in having a successfully developed gamified health app rather than empirical evidence. Recent frameworks including our own are designed around guidelines for complex interventions involving a systematic development process with an iterative user-centered approach based on theory and evidence. It is likely that these elements are key for the development of health apps that may be effective at modifying health behaviors. Although there are smoking cessation apps that incorporate gamification techniques, to date, there is no publicly available dedicated game to promote smoking cessation or guidance for the development of gamified health apps. 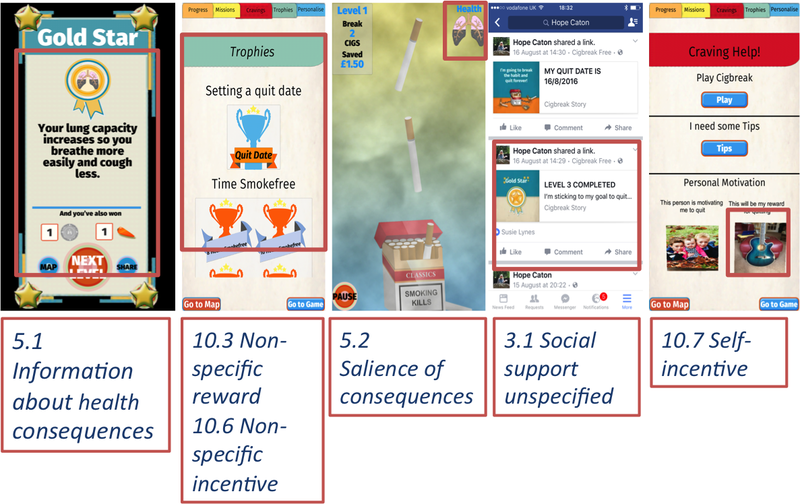 Raiff and colleagues have developed a prototype smoking cessation mobile phone game using the concept of contingency management (delivering rewards contingent on objective evidence of smoking abstinence) with virtual in-game rewards and social connectivity. The prototype game differs from Cigbreak in concept and mechanic, with the prototype game involving swiping pollen-gems, not including imagery of cigarettes or smoking- related cues. In addition, 71% of participants in a small usability study reported that the program would help them personally to quit smoking . The prototype has not yet been released on app stores and is still in development. In this study, an example is provided of a systematic approach for developing a gamified smoking cessation app with systematic use of BCTs and evidence-based practice guided by user input. This could provide a potential methodology for development of other gamified health apps. However, the framework proposed has not been evaluated, and thus it cannot be concluded that apps developed using this framework are superior or that the methods adopted are superior to other methods. Future work could include a comparison of usability or acceptability outcomes and behavior change outcomes for apps developed using this framework compared with apps that have not used this framework. The rapidly changing technological landscape and change in sophistication of users may limit the applicability of the findings to future app development. There are further limitations to the methods adopted. Focus groups can be subject to group bias; however, in turn, small focus groups can generate a natural open discussion, providing fruitful feedback as to usability. Participants were given different iterations of the app to use during the focus groups, which may potentially have biased participants to focus on the functionality of the app presented to them. However, this is a natural consequence of agile iterative development. Only 1 trained researcher independently analyzed the focus group transcripts, which may have led to bias; however; any uncertainties found were discussed with the study team. Although Cigbreak has been made available to the public on a small scale, the app has not yet been formally evaluated against clinical endpoints. A rigorous evaluation to assess impact on short- and long-term quit rates is being planned. Mobile phone games could provide a potentially cost-effective platform for health promotion and thus have a substantial public health impact. However, developers of digital interventions need to adhere to existing regulatory frameworks and emerging standards [24,69] to develop games that health practitioners can feel confident to recommend to patients. Questions remain as to the best way to evaluate health apps in this rapidly changing field, without stifling innovation. Michie and colleagues present recent consensus from experts at an international workshop on digital interventions in relation to health behaviors, concluding that evaluations should be made during all phases of the development cycle and need not rely solely on traditional methods . New experimental methods and adaptive research designs such as A/B testing and N-of-1 studies may be used to make best use of rich data streams and assess outcomes within shorter time frames . There is considerable scope for using emerging methods of analyzing observational data in this context . Further work is needed to identify potential causal pathways and mechanisms in health apps in general and specifically for Cigbreak. Existing methods such as structured equation modeling and pathway analysis can be applied to study short- to medium-term effects such as Cigbreak engagement. However, current methods only explore assumed causal relations between limited numbers of variables and are not well adapted to complex models or digital interventions. Thus, there are exciting possibilities for future development of more refined analysis of applications and for generating ecologically valid, real-time objective data. Game analytics provide a rich source of data, and machine learning techniques can be used to make changes to the game design to improve the users’ experience and potentially to modify health outcomes. The key is to ensure that the correct metrics are captured during gameplay and then to use the techniques to identify patterns in the data. It should then be possible to change gameplay adaptively to optimize some chosen criteria. These methods could be used to change health behavior if this is being captured as one of the metrics. Bauckhage and colleagues  discuss a number of the methods in clustering game behavior data, and use of such techniques in Cigbreak is currently being explored. Future research also aims to ascertain which components of a multicomponent intervention such as Cigbreak are accounting for what effects. HC was the game designer. EAE, HC, and RTW were involved in conception and design of the study. EAE, HC, CR, LS, and RTW were involved in the interpretation of the results. EAE, LS, and CR collected focus group data, and LS provided behavior change technique advice. EAE and RTW drafted the manuscript; HC, CR, LS, JL, YP, SJ, CN, AS, SM, JQS, DG, and CJG revised the manuscript critically for intellectual content. All authors approved the final version of the paper. All authors had access to all study data and take responsibility for data integrity and accuracy of the analysis. RTW is the guarantor. RTW is an National Institute for Health Research (NIHR) Senior Investigator and Chief Investigator on NIHR Program grant RP-PG-0609-10181. EAE is an NIHR-funded in-practice Fellow. JL is conducting a PhD funded by the Economic and Social Research Council and Cambridge Cognition Limited. HC is a mobile phone game developer and director of Healthy Games. British Standards Institution. Health and wellness apps.Quality criteria across the life cycle. Code of Practice. London, UK: BSI; 2015. Ritchie J. Qualitative data analysis for applied policy research. In: In Analysing Qualitative Data. London: Routledge; 1994. Hunicke R, LeBlanc M, Zubek R. MDA: A Formal Approach to Game Design and Game Research. 2004 Presented at: Game Developers Conference; 2004; San Jose. Ferdig RE. Handbook of Research on Effective Electronic Gaming in Education (Three Volume Set). USA: Information Science Reference; 2018. Pearl J. Causality. Cambridge: Cambridge University Press; 2009. Spirtes P, Glymour C, Scheines R. Causation, Prediction, and Search. Massachusetts: MIT Press; 2001. Kline R. Principles and Practice of Structural Equation Modeling, Fourth Edition (Methodology in the Social Sciences). New York: The Guilford Press; 2015. Pearl J. The Causal Foundations of Structural Equation Modeling. In: Hoyle R, editor. Handbook of Structural Equation Modeling. New York: Guilford Press; 2012. Glanz K, Rimer BK, Viswanath K. Health Behavior and Health Education: Theory, Research, and Practice. Hoboken: Wiley, John & Sons, Incorporated; 2008. ©Elizabeth A Edwards, Hope Caton, Jim Lumsden, Carol Rivas, Liz Steed, Yutthana Pirunsarn, Sandra Jumbe, Chris Newby, Aditi Shenvi, Samaresh Mazumdar, Jim Q Smith, Darrel Greenhill, Chris J Griffiths, Robert T Walton. Originally published in JMIR Serious Games (http://games.jmir.org), 29.11.2018.